If you want people to get the right idea about you and your company, you need to have the right business cards. You want their impression to accurately convey the professional approach of your work. If you want people to trust that you do quality work, you need to present them with a quality business card. But what makes a good business card? 1.Use a good quality paper and consider adding an extra finish to your business card. The paper you choose for your cards can make a huge difference to how your card is perceived. Using good paper shows your clients that you are willing to invest to get better results and higher quality products. An additional finish such as Spot UV, embossing and foil blocking can add style and sophistication to your business cards. 2.Clearly display of your company name. Your company name should be centre stage, along with your logo. * Brand recognition is key in business and you’ll need to ensure that people know who you are. *Please note, if you do have not a logo then give us a call on 01543 261220 as we can help you with this. 3.Tell people what your company does. Do not assume that people can guess what you do from your company name. If your company name is “Handy Man Services” it is be quite straightforward to work out what you do. However if your company name is not obvious or abbreviated, then spell it out for people. Perhaps include 2-3 short bullet points about your services or list some of your products. You can always use the back of the business card for this information. The ‘keep it simple’ design philosophy is often one of the best when it comes to small spaces. The use lots of blank space, it does not have to be white, plus simple typeface can be very effective. Create contrast with colour. 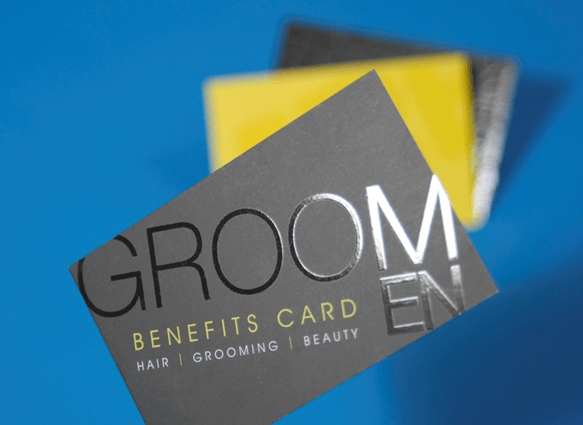 Stick to one or two colours for the text on your business cards to give them a modern and sophisticated look. Keep your colour scheme consistent throughout your marketing (stationery, leaflets, website) to develop a professional image of yourself. If you need any help in the design of your business card the creative team at Raphael Design would love to help you.Plus, in January we have seven styles of printing.com business cards at half price. Click here for some hot deals. So why not get a new look in 2015 by calling 01543 261220 or send us an email.